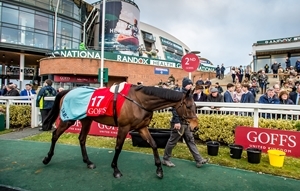 Outstanding results on the track and a catalogue of 24 top-class Pointers attracted all the major National Hunt buyers to Aintree Racecourse for this evening’s Goffs UK Aintree Sale which celebrated new records with rises in figures across the board. Topping this evening’s sale was Stuart Crawford’s debut winning Pointer Malone Road (Lot 17) who sold to Tom Malone and Gordon Elliott for £325,000. The 4YO son of Kalanisi was a most impressive winner at Loughanmore in March and was purchased on behalf of David and Patricia Thompson, owners of the 1992 Grand National winner Party Politics, and now Seeyouatmidnight who will race in Saturday’s Randox Health Grand National. Malone Road was one of three horses to sell in excess of £200,000 with Knockanglass Stables’ Champagne Platinum (Lot 10) selling to Kieran McManus for £250,000 and Denis Murphy’s Little Light (Lot 19) selling to Aiden Murphy for £200,000. In all 13 horses sold for £100,000 or more with average growing 14% to £115,095 and the median growing 16% to £100,000. “The results from this sale have been outstanding and now in its third year, the Aintree Sale has cemented its place as a leading outlet for top-class Pointers and Form Horses with significant rises in every statistic.